Peter H. Burnett 1807 – 1985 Store owner, lawyer, farmer, road builder and Provisional Supreme Court Judge. Signer of Oregon’s first exclusion laws. California Gold rush miner, land sale broker, and first Governor of the new state of California (1849-1851). A supporter of Chinese Exclusion Act and extermination of local California Indian tribes. 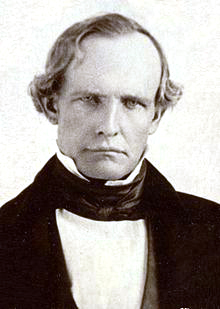 Before securing his position as California’s first Governor (1849 – 1851), Burnett moved his family from Missouri to Oregon on a wagon train. 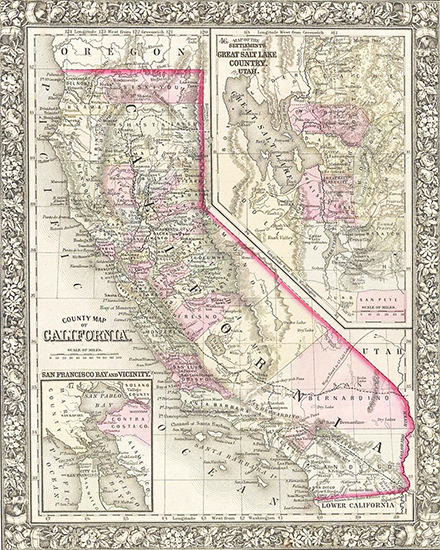 Twenty months ago California was inhabited by a sparse population – a pastoral people – deriving their main sustenance from their flocks and herds, and a scanty cultivation of the soil; their trade and business limited, and their principal exports consisting of hides and tallow. Within that short period has been made the discovery of the rich, extensive, and exhaustless gold mines of California; and how great have already been its effects! The trade and business of the country have been revolutionized and reversed – the population increased beyond all expectation – commerce extended – our ports filled with shipping from every nation and clime – our commercial cities have sprung up as if by enchantment – our beautiful bays and placid streams now navigated by the power of the energetic, intrepid, and sensible people of California have formed a Constitution for our new State – the Pacific Star. Our Constitution has wisely prohibited Slavery with the State; so that the people of California are once and forever free from this great social and political evil. Governor Burnet was instrumental in drawing the first county boundaries in the state. For some years past, I have given this subject my most candid and serious attention, and I most cheerfully lay before you the result of my own reflections. There is, in my opinion, but one of two consistent courses to take in reference to this class of population, – either to admit them to the full and fee enjoyment of all the privileges guaranteed by the Constitution to others, or exclude them from the State. If we permit them to settle in our State, under existing circumstances, we consign them, by our own institutions, and the usages of own society, to a subordinate and degraded position, which is in itself but a species of slavery. They would be placed in a situation where they would have no efficient motives for moral or intellectual improvement, but must remain in our midst, sensible of their degradation, unhappy themselves, enemies to the institutions and the society whose usages, have placed them there, and for ever fit teachers in all the schools of ignorance, vice, and idleness. It could be no favor, and no kindness, to permit that class of population to settle in the State under such humiliating conditions, although they might think otherwise; while it would be a most serious injury to us. Had they been born here, and had acquired rights in consequence, I should not recommend any measures to expel them. They are not now here, – except a few in comparison with the numbers that would be here, – and the object is to keep them out. I, therefore, call your most serious attention to this subject, believing it to be one of the first importance. We have a new community to organize, a new State to build up. We have also to create and sustain a reputation, in the face of the misconceptions of our character that are entertained elsewhere. But we have the most ample and the most excellent materials, out of which to construct a great community and a great State. The emigration to this country from the States East of the Rocky Mountains consists of their most energetic, enterprising, and intelligent population, while the timid and idle, who had neither the energy nor the means to get here, were left to remain at home.